My journey to Tagaytay in the Philippines wasn’t quite what I had signed up for. 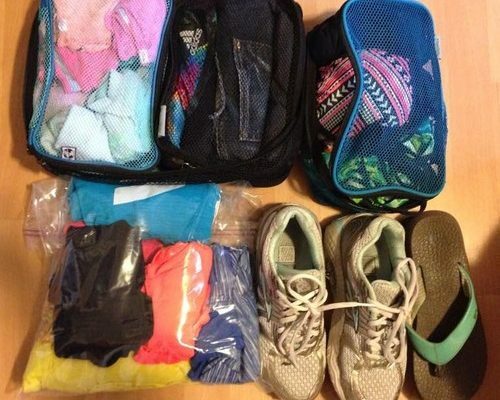 However, that can be one of the fun parts about travel. When visiting Manila for TBEX, a conference for travel bloggers and media, I signed up for a Pre-BEX tour. These tours are offered to attendees of the conference free of charge to allow them to explore the city the conference is in and the surrounding area. When I went to sign-up for a tour that interested me, I was sad that the one I wanted the most (volcano trekking) was booked solid. 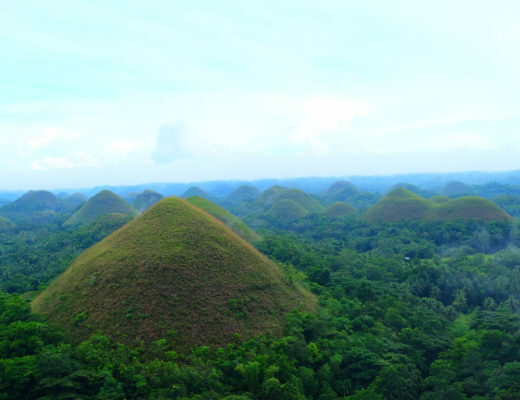 So since I knew I wouldn’t have a chance to visit the Taal Volcano while in Manila, I selected another tour which would take me to at least see the volcano from a distance. Taal Volcano is located about an hour and a half drive from Manila near a town called Tagaytay. Our original journey was to leave Manila, and on route stop at the Las Piñas Bamboo Organ, to the Sarao Jeepney Factory, on to a glass museum, Museo Orlina, lunch at Bag of Beans and then off to the little volcano village of Taal where we would have a chance to explore. I was excited about my day and excited to leave the busy city of Manila to explore an off-the-beaten-path I probably wouldn’t have seen had I not had the opportunity through TBEX. Our first stop was to visit the Las Piñas Bamboo Organ located in the St. Joseph Parish Church in Las Piñas City, which is about a 40 minute drive (without traffic). 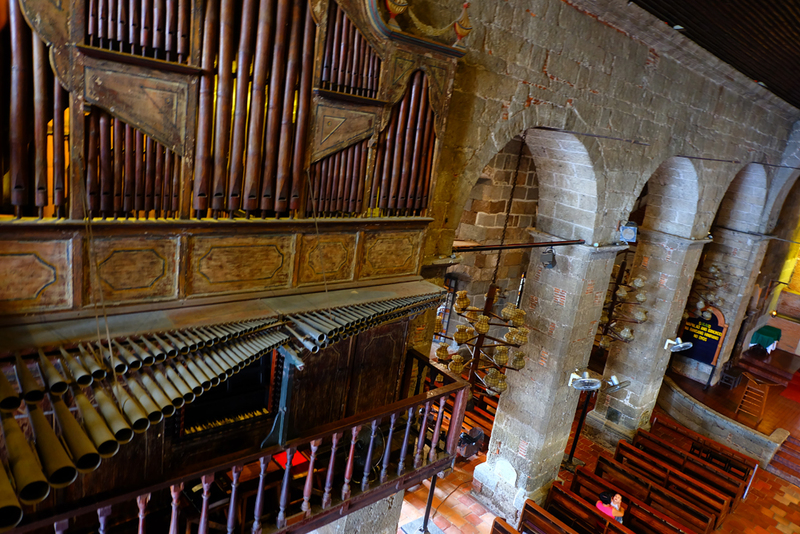 This bamboo organ is from the 19th century and is made entirely of bamboo. The organ was cool to see, and the little church was really nice (I love churches in other countries), however, I wouldn’t ever suggest for people to drive out of their way to go see it, unless you have a love for unique musical instruments. After our stop visiting the bamboo organ, we boarded the bus to head to the Sarao Jeepney Factory. 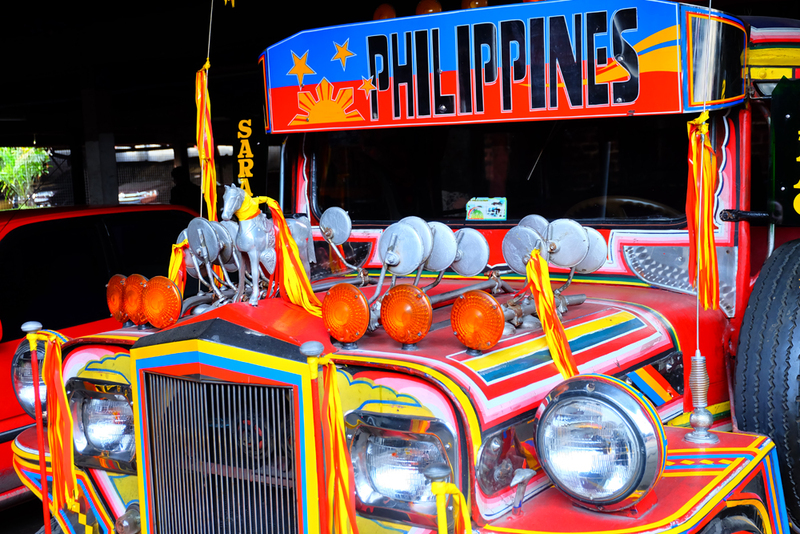 The jeepney is coined the “king of the road” in the Philippines, in particular, Manila and serves as a local form of public transportation. The Sarao Jeepney Factory in Las Piñas City is incredibly interesting to visit because it’s the actual working factory which is open to visitors free of charge. The factory currently produces approximately only ten of these vehicles a month but that is because production has been slowed down due to the traffic issues in and around Manila. You can walk into the factory and check out some of their finished and in progress jeepneys which really is a super unique opportunity and probably a highlight from the day. Moving along our journey to Tagaytay, and after a stop at some local roadside fruit vendors to try some fruits I’ve never even tried or seen before like the jackfruit, mangostines and pomelos, we were headed for the Museo Orlina. 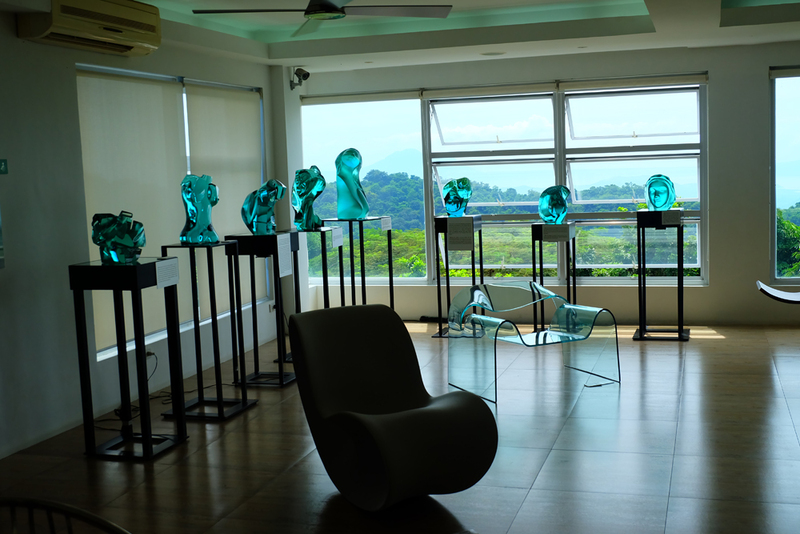 This museum displays the works of art from artist Ramon G. Orlina, a world renowned Filipino glass sculpture. Once again, I wasn’t entirely into this stop. The glass was beautiful, but we spent too much time there and 99% of the group we were with were mainly intrigued by the rooftop patio in the museum which gave a panoramic view of the Taal Volcano. Little did we know, this was the only time we’d actually get to admire the volcano the whole day. Following the museum, we headed for lunch at Bag of Beans. This was hands down my best meal I had during my whole 2.5 weeks in the Philippines. 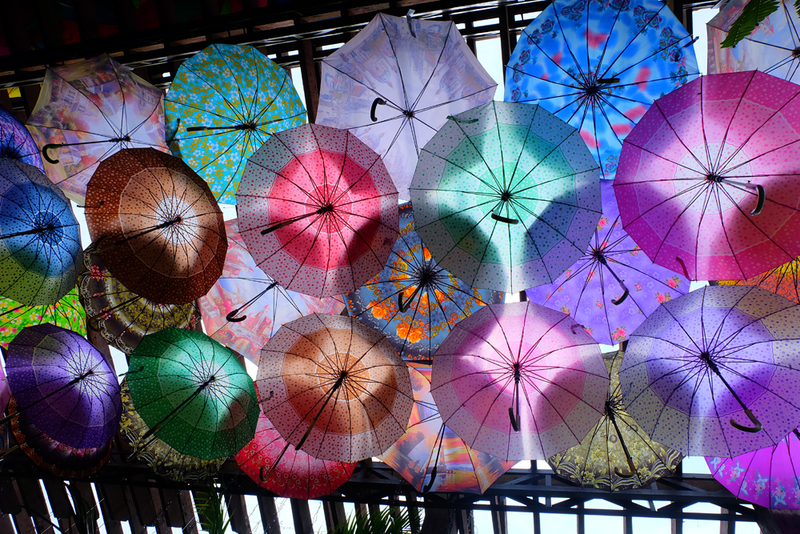 The restaurant was super cute with a colourful umbrella archway, and an outdoorsy, yet classic and funky feel. 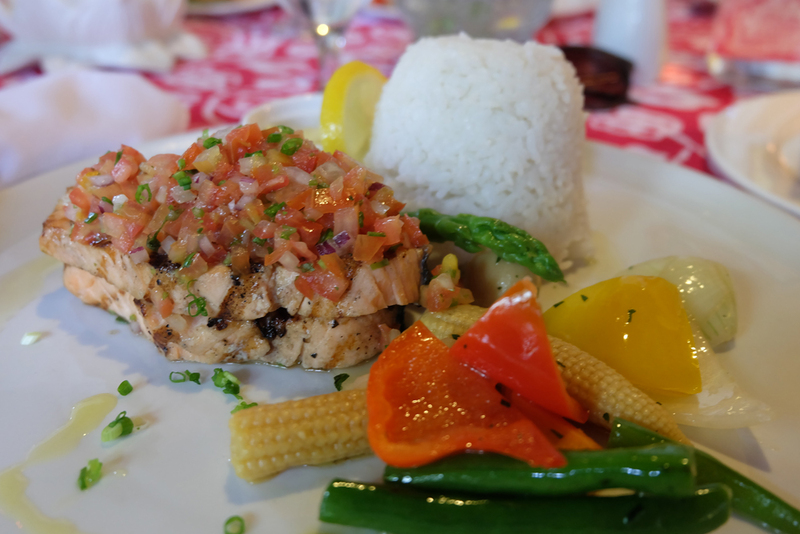 We were served a fresh coconut water, a delicious salmon dish with roasted vegetables and a fresh salsa and a yummy soup. I loved the vibe of this restaurant and the meal was fabulous. After lunch, our guides broke the news to us that it just wasn’t going to be possible to get us to the Taal village. Due to their poor planning, and spending too much time at some of our stops, combined with the traffic, we just weren’t going to be able to cram it all into one day. We were disappointed, however, we knew we had to be back in Manila for the opening party of the conference and if not going meant that we were able to make it in time, then what could we do? Our schedule then changed to us going to all get back massages, I mean, I can’t really complain when I’m going to get a free massage. 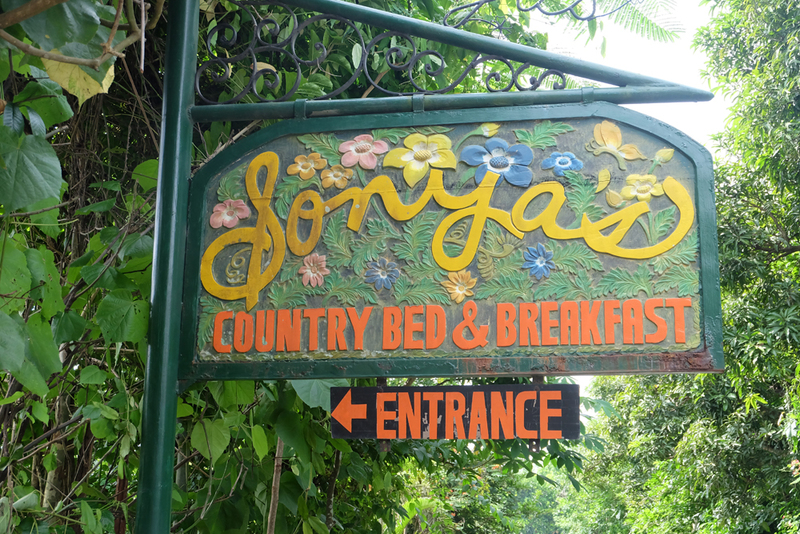 We headed off to Sonya’s Garden, a bed and breakfast located in Tagaytay. Sonya’s is a beautiful and peaceful oasis. 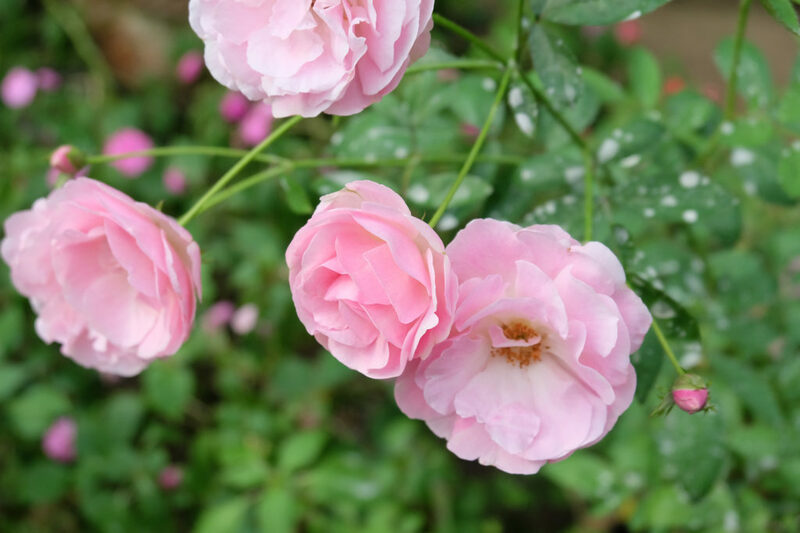 The bed and breakfast is surrounded by lush and colourful gardens, and guests can rent gorgeous cottages across the property. It makes for the perfect place for a quiet, relaxing and/or romantic retreat. 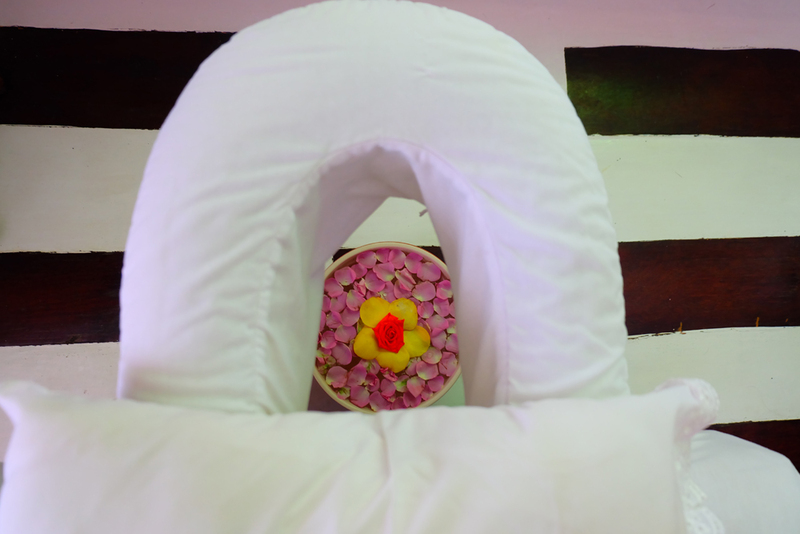 Located on the property is a spa which is where we headed for our massages. Girls were brought into a different area then the men, however, it was still a bit awkward since some of us were placed in couple massage rooms where we then got naked and had massages next to a stranger/someone on the tour that we likely didn’t already know. 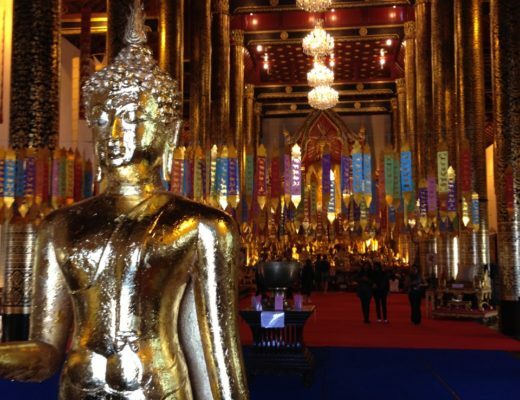 However, the massage was wonderful and the surroundings made it even more peaceful and relaxing. Feeling refreshed and after exploring some of the grounds at Sonya’s, we finally headed back on the bus to head back to Manila. However, although this change in our itinerary was supposed to get us back to the city on time for the opening party of TBEX, we ended up stuck in traffic for about four hours (over double the amount of time it was supposed to take without traffic). I was disappointed on the poor planning on behalf of the tourism board who arranged these tours. The itinerary was clearly too ambitious to get done from 9-4pm with the crazy traffic in and around Manila, however, it still ended up to be a great day exploring places I’ve never been. Sometimes things don’t work out how you initially plan, but you can choose to either let it ruin your whole trip or embrace it.